A boy and man injured in a stabbing which left a London drill rapper dead have been arrested on suspicion of murder. 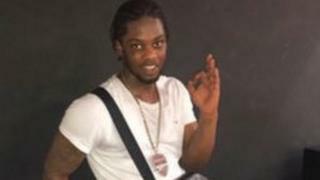 Siddique Kamara, also known as Incognito and SK, died of stab wounds on Warham Street, Camberwell, on Wednesday evening. The boy, 16, and man, 31, remain in hospital under arrest, police said. Two other men arrested near to the scene have since been released under investigation. Mr Kamara, 23, died of two stab wounds to the chest, a post-mortem examination revealed. The two suspects, who were airlifted to hospital, have non life-threatening injuries, the Met Police said. The Met put an S60 order in place on Friday night to give officers extra stop and search powers because of the “escalating violence” in Southwark and Lambeth. Mr Kamara was a rapper in the music group Moscow17. He was friends with fellow rapper Rhyhiem Ainsworth Barton, who was found with fatal gunshot wounds in Warham Street in May. Mr Kamara was accused and cleared of murdering Abdirahman Mohamed – a brother of a member of a rival group, Zone 2 – alongside another member of Moscow17, Kevin Aka-Kadjo. The Met said “one line of inquiry is this being gang-related”. Reality Check: is London’s murder rate still higher than New York’s? Drill: Is it right to blame the music genre for violence? In an interview earlier this year, Mr Kamara said music has influenced crime in London. Det Supt Helen Lyons said there is “a significantly increased police presence” in the area where Mr Kamara was murdered as enquiries continue.